Traded to Jets by Hartford Whalers for Dave Babych, November 21, 1985. Traded to Boston Bruins for Moe Lemay, December 30, 1988. 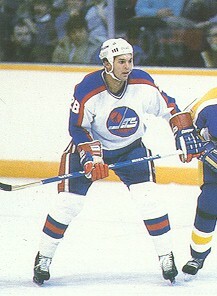 In a controversial trade, the Jets acquired winger Ray Neufeld from the Hartford Whalers in exchange for Dave Babych in November 1985. He played parts of four seasons with the Jets and though he was largely a disappointment, he did manage to score 61 goals as a Jet. The Jets traded him to the Boston Bruins in December 1988 and he wound up his playing career after the 1989-1990 season. His best NHL years came with the Whalers, but he wasn't able to duplicate his success in Hartford with the Jets.